You are currently browsing the category archive for the ‘math.AT’ category. In the previous set of notes we saw that functions that were holomorphic on an open set enjoyed a large number of useful properties, particularly if the domain was simply connected. In many situations, though, we need to consider functions that are only holomorphic (or even well-defined) on most of a domain , thus they are actually functions outside of some small singular set inside . (In this set of notes we only consider interior singularities; one can also discuss singular behaviour at the boundary of , but this is a whole separate topic and will not be pursued here.) Since we have only defined the notion of holomorphicity on open sets, we will require the singular sets to be closed, so that the domain on which remains holomorphic is still open. A typical class of examples are the functions of the form that were already encountered in the Cauchy integral formula; if is holomorphic and , such a function would be holomorphic save for a singularity at . Another basic class of examples are the rational functions , which are holomorphic outside of the zeroes of the denominator . Singularities come in varying levels of “badness” in complex analysis. 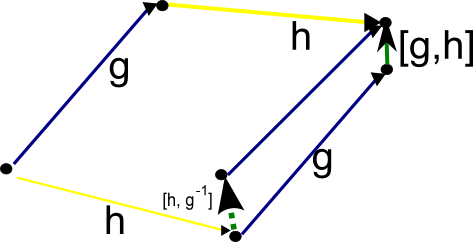 The least harmful type of singularity is the removable singularity – a point which is an isolated singularity (i.e., an isolated point of the singular set ) where the function is undefined, but for which one can extend the function across the singularity in such a fashion that the function becomes holomorphic in a neighbourhood of the singularity. 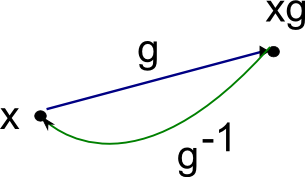 A typical example is that of the complex sinc function , which has a removable singularity at the origin , which can be removed by declaring the sinc function to equal at . The detection of isolated removable singularities can be accomplished by Riemann’s theorem on removable singularities (Exercise 35 from Notes 3): if a holomorphic function is bounded near an isolated singularity , then the singularity at may be removed. After removable singularities, the mildest form of singularity one can encounter is that of a pole – an isolated singularity such that can be factored as for some (known as the order of the pole), where has a removable singularity at (and is non-zero at once the singularity is removed). Such functions have already made a frequent appearance in previous notes, particularly the case of simple poles when . The behaviour near of function with a pole of order is well understood: for instance, goes to infinity as approaches (at a rate comparable to ). These singularities are not, strictly speaking, removable; but if one compactifies the range of the holomorphic function to a slightly larger space known as the Riemann sphere, then the singularity can be removed. In particular, functions which only have isolated singularities that are either poles or removable can be extended to holomorphic functions to the Riemann sphere. Such functions are known as meromorphic functions, and are nearly as well-behaved as holomorphic functions in many ways. In fact, in one key respect, the family of meromorphic functions is better: the meromorphic functions on turn out to form a field, in particular the quotient of two meromorphic functions is again meromorphic (if the denominator is not identically zero). Unfortunately, there are isolated singularities that are neither removable or poles, and are known as essential singularities. A typical example is the function , which turns out to have an essential singularity at . The behaviour of such essential singularities is quite wild; we will show here the Casorati-Weierstrass theorem, which shows that the image of near the essential singularity is dense in the complex plane, as well as the more difficult great Picard theorem which asserts that in fact the image can omit at most one point in the complex plane. Nevertheless, around any isolated singularity (even the essential ones) , it is possible to expand as a variant of a Taylor series known as a Laurent series . The coefficient of this series is particularly important for contour integration purposes, and is known as the residue of at the isolated singularity . These residues play a central role in a common generalisation of Cauchy’s theorem and the Cauchy integral formula known as the residue theorem, which is a particularly useful tool for computing (or at least transforming) contour integrals of meromorphic functions, and has proven to be a particularly popular technique to use in analytic number theory. Within complex analysis, one important consequence of the residue theorem is the argument principle, which gives a topological (and analytical) way to control the zeroes and poles of a meromorphic function. Finally, there are the non-isolated singularities. Little can be said about these singularities in general (for instance, the residue theorem does not directly apply in the presence of such singularities), but certain types of non-isolated singularities are still relatively easy to understand. One particularly common example of such non-isolated singularity arises when trying to invert a non-injective function, such as the complex exponential or a power function , leading to branches of multivalued functions such as the complex logarithm or the root function respectively. Such branches will typically have a non-isolated singularity along a branch cut; this branch cut can be moved around the complex domain by switching from one branch to another, but usually cannot be eliminated entirely, unless one is willing to lift up the domain to a more general type of domain known as a Riemann surface. As such, one can view branch cuts as being an “artificial” form of singularity, being an artefact of a choice of local coordinates of a Riemann surface, rather than reflecting any intrinsic singularity of the function itself. The further study of Riemann surfaces is an important topic in complex analysis (as well as the related fields of complex geometry and algebraic geometry), but unfortunately this topic will probably be postponed to the next course in this sequence (which I will not be teaching). 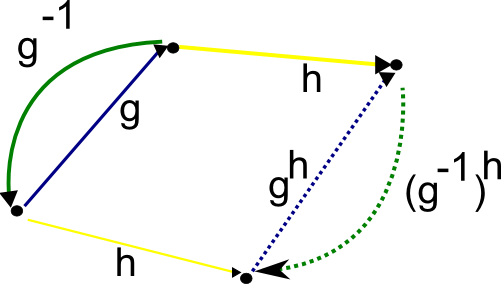 Definition 1 (Homotopy) Let be an open subset of , and let , be two curves in . (i) If have the same initial point and final point , we say that and are homotopic with fixed endpoints in if there exists a continuous map such that and for all , and such that and for all . (ii) If are closed (but possibly with different initial points), we say that and are homotopic as closed curves in if there exists a continuous map such that and for all , and such that for all . (iii) If and are curves with the same initial point and same final point, we say that and are homotopic with fixed endpoints up to reparameterisation in if there is a reparameterisation of which is homotopic with fixed endpoints in to a reparameterisation of . (iv) If and are closed curves, we say that and are homotopic as closed curves up to reparameterisation in if there is a reparameterisation of which is homotopic as closed curves in to a reparameterisation of . In the first two cases, the map will be referred to as a homotopy from to , and we will also say that can be continously deformed to (either with fixed endpoints, or as closed curves). 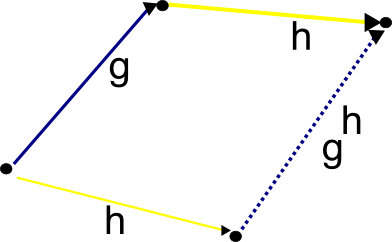 For a similar reason, in a convex open set , any two closed curves will be homotopic to each other as closed curves. Exercise 3 Let be an open subset of . (i) Prove that the property of being homotopic with fixed endpoints in is an equivalence relation. (ii) Prove that the property of being homotopic as closed curves in is an equivalence relation. (iii) If are closed curves with the same initial point, show that is homotopic to as closed curves if and only if is homotopic to with fixed endpoints for some closed curve with the same initial point as or . (v) If are curves with the same initial point and the same terminal point, show that is homotopic to with fixed endpoints in if and only if is homotopic to a point in . (vi) If is connected, and are any two curves in , show that there exists a continuous map such that and for all . Thus the notion of homotopy becomes rather trivial if one does not fix the endpoints or require the curve to be closed. (vii) Show that if is a reparameterisation of , then and are homotopic with fixed endpoints in U. (viii) Prove that the property of being homotopic with fixed endpoints in up to reparameterisation is an equivalence relation. (ix) Prove that the property of being homotopic as closed curves in up to reparameterisation is an equivalence relation. 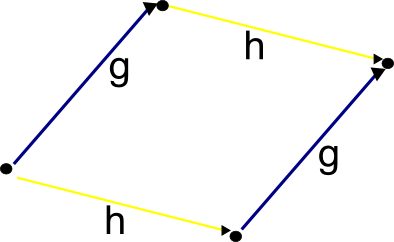 Theorem 4 (Cauchy’s theorem) Let be an open subset of , and let be holomorphic. Corollary 5 (Cauchy’s theorem, again) Let be an open subset of , and let be holomorphic. Then for any closed rectifiable curve in that is contractible in to a point, one has . Exercise 6 Show that Theorem 4 and Corollary 5 are logically equivalent. 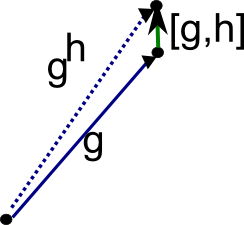 As a consequence of this and Cauchy’s theorem, we conclude that the contour is not contractible to a point in ; note that this does not contradict Example 2 because is not convex. Thus we see that the lack of holomorphicity (or singularity) of at the origin can be “blamed” for the non-vanishing of the integral of on the closed contour , even though this contour does not come anywhere near the origin. Thus we see that the global behaviour of , not just the behaviour in the local neighbourhood of , has an impact on the contour integral. In order for this to be consistent with Cauchy’s theorem, we conclude that and are not homotopic in (even after reparameterisation). In the specific case of functions of the form , or more generally for some point and some that is holomorphic in some neighbourhood of , we can quantify the precise failure of Cauchy’s theorem through the Cauchy integral formula, and through the concept of a winding number. These turn out to be extremely powerful tools for understanding both the nature of holomorphic functions and the topology of open subsets of the complex plane, as we shall see in this and later notes. If is a connected topological manifold, and is a point in , the (topological) fundamental group of at is traditionally defined as the space of equivalence classes of loops starting and ending at , with two loops considered equivalent if they are homotopic to each other. (One can of course define the fundamental group for more general classes of topological spaces, such as locally path connected spaces, but we will stick with topological manifolds in order to avoid pathologies.) As the name suggests, it is one of the most basic topological invariants of a manifold, which among other things can be used to classify the covering spaces of that manifold. Indeed, given any such covering , the fundamental group acts (on the right) by monodromy on the fibre , and conversely given any discrete set with a right action of , one can find a covering space with that monodromy action (this can be done by “tensoring” the universal cover with the given action, as illustrated below the fold). In more category-theoretic terms: monodromy produces an equivalence of categories between the category of covers of , and the category of discrete -sets. Theorem 1 (van Kampen’s theorem) Let be connected open sets covering a connected topological manifold with also connected, and let be an element of . Then is isomorphic to the amalgamated free product . 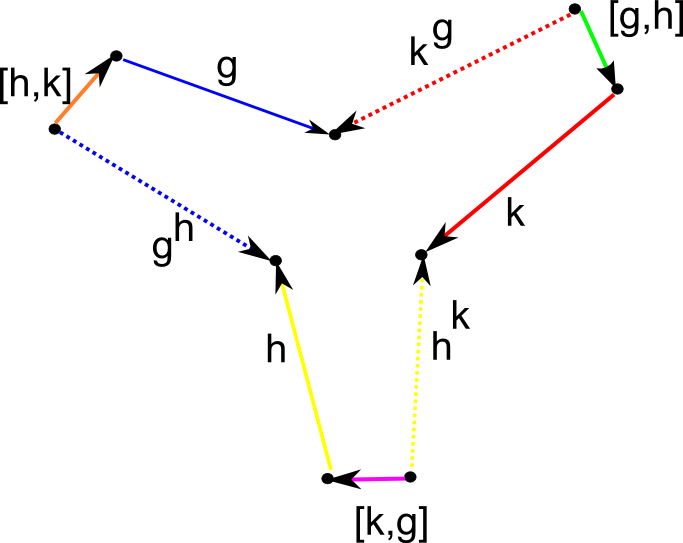 Since the topological fundamental group is customarily defined using loops, it is not surprising that many proofs of van Kampen’s theorem (e.g. the one in Hatcher’s text) proceed by an analysis of the loops in , carefully deforming them into combinations of loops in or in and using the combinatorial description of the amalgamated free product (which was discussed in this previous blog post). But I recently learned (thanks to the responses to this recent MathOverflow question of mine) that by using the above-mentioned equivalence of categories, one can convert statements about fundamental groups to statements about coverings. In particular, van Kampen’s theorem turns out to be equivalent to a basic statement about how to glue a cover of and a cover of together to give a cover of , and the amalgamated free product emerges through its categorical definition as a coproduct, rather than through its combinatorial description. One advantage of this alternate proof is that it can be extended to other contexts (such as the étale fundamental groups of varieties or schemes) in which the concept of a path or loop is no longer useful, but for which the notion of a covering is still important. I am thus recording (mostly for my own benefit) the covering-based proof of van Kampen’s theorem in the topological setting below the fold. This is a sequel to my previous blog post “Cayley graphs and the geometry of groups“. 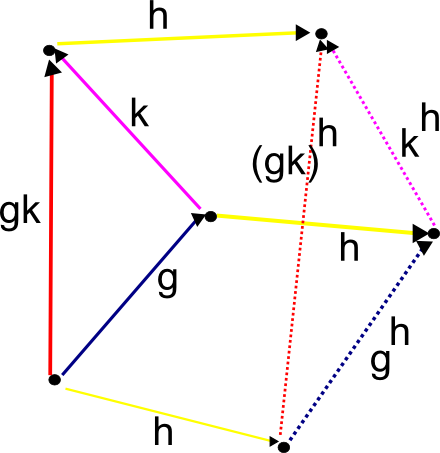 In that post, the concept of a Cayley graph of a group was used to place some geometry on that group . 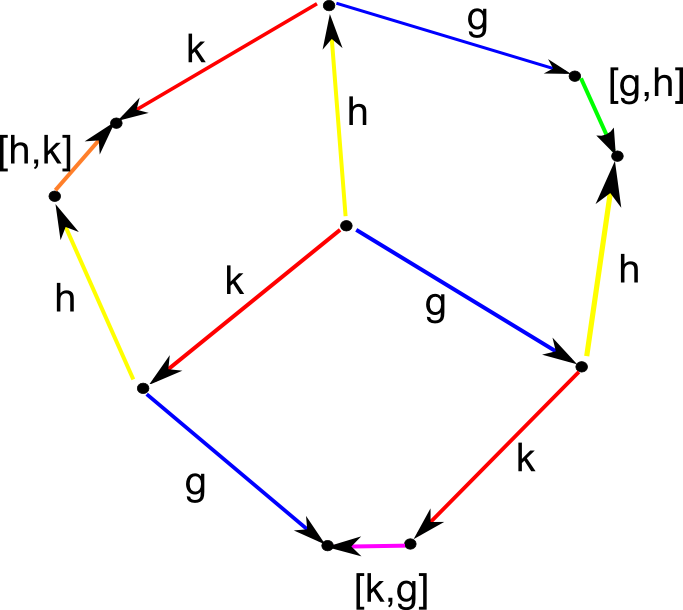 In this post, we explore a variant of that theme, in which (fragments of) a Cayley graph on is used to describe the basic algebraic structure of , and in particular on elementary word identities in . Readers who are familiar with either category theory or group homology/cohomology will recognise these concepts lurking not far beneath the surface; we wil remark briefly on these connections later in this post. However, no knowledge of categories or cohomology is needed for the main discussion, which is primarily focused on elementary group theory. Throughout this post, we fix a single group , which is allowed to be non-abelian and/or infinite. All our graphs will be directed, with loops and multiple edges permitted. One usually does not work with the complete Cayley graph . It is customary to instead work with smaller Cayley graphs , in which the edge colours are restricted to a smaller subset of , such as a set of generators for . 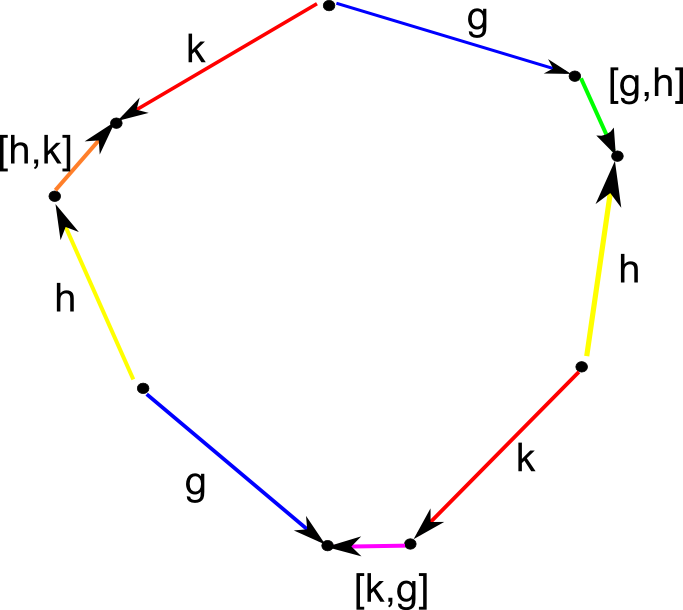 As we will be working locally, we will in fact work with even smaller fragments of at a time; in particular, we only use a handful of colours (no more than nine, in fact, for any given diagram), and we will not require these colours to generate the entire group (we do not care if the Cayley graph is connected or not, as this is a global property rather than a local one). We will however omit the identity loops in our diagrams in order to reduce clutter. We make the obvious remark that any directed edge in a diagram can be coloured by at most one group element , since implies . This simple observation provides a way to prove group theoretic identities using diagrams: to show that two group elements are equal, it suffices to show that they connect together (with the same orientation) the same pair of vertices in a diagram. Remark 1 One can also interpret these diagrams as commutative diagrams in a category in which all the objects are copies of , and the morphisms are right-translation maps. However, we will deviate somewhat from the category theoretic way of thinking here by focusing on the geometric arrangement and shape of these diagrams, rather than on their abstract combinatorial description. In particular, we view the arrows more as distorted analogues of vector arrows, than as the abstract arrows appearing in category theory. A fundamental operation for us will be that of gluing two diagrams together. Lemma 1 ((Labeled) gluing) Let be two diagrams of a given group . Suppose that the intersection of the two diagrams connects all of (i.e. any two elements of are joined by a path in ). Then the union is also a diagram of . 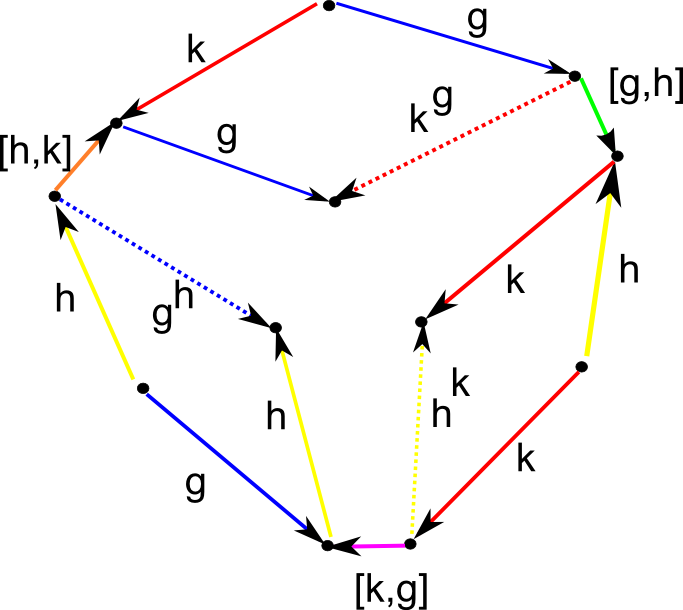 Proof: By hypothesis, we have graph homomorphisms , . 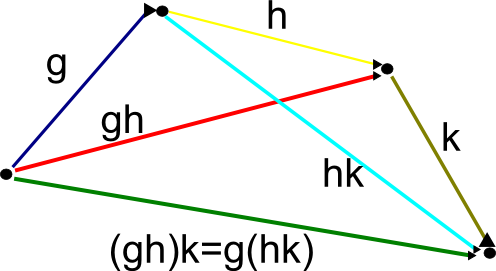 If they agree on then one simply glues together the two homomorphisms to create a new graph homomorphism . 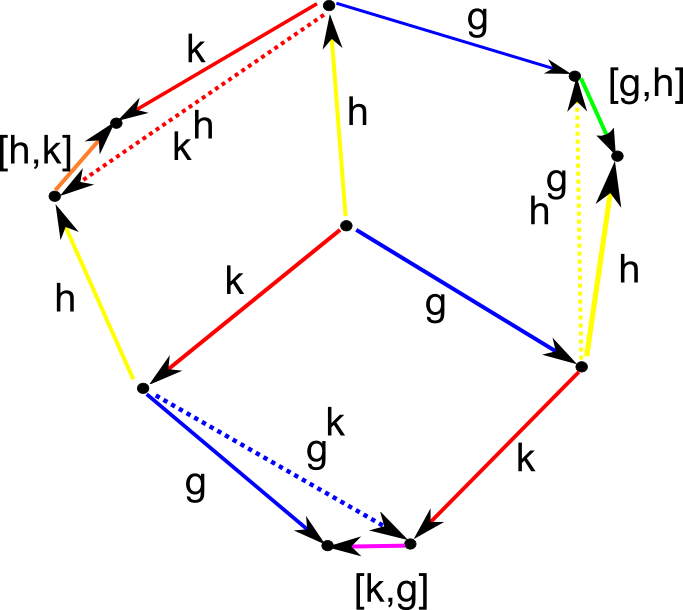 If they do not agree, one can apply a left translation to either or to make the two diagrams agree on at least one vertex of ; then by the connected nature of we see that they now must agree on all vertices of , and then we can form the glued graph homomorphism as before. 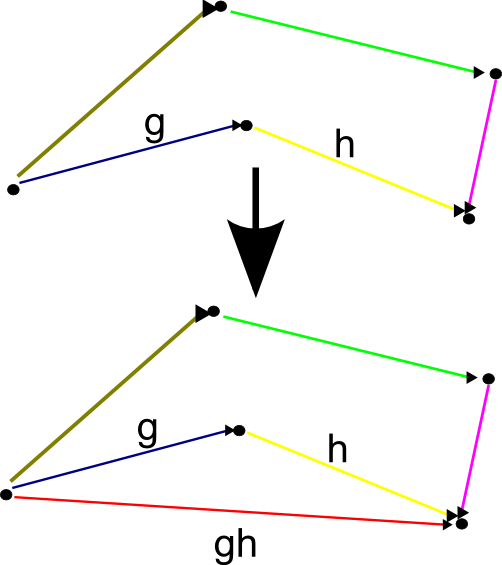 The above lemma required one to specify the label the vertices of (in order to form the intersection and union ). However, if one is presented with two diagrams with unlabeled vertices, one can identify some partial set of vertices of with a partial set of vertices of of matching cardinality. 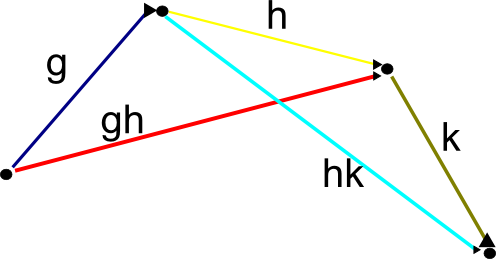 Provided that the subdiagram common to and after this identification connects all of the common vertices together, we may use the above lemma to create a glued diagram . In addition to gluing, we will also use the trivial operation of erasing: if is a diagram for a group , then any subgraph of (formed by removing vertices and/or edges) is also a diagram of . This operation is not strictly necessary for our applications, but serves to reduce clutter in the pictures. We will tend to depict commutator edges as being somewhat shorter than the edges generating that commutator, reflecting a “perturbative” or “nilpotent” philosophy. (Of course, to fully reflect a nilpotent perspective, one should orient commutator edges in a different dimension from their generating edges, but of course the diagrams drawn here do not have enough dimensions to display this perspective easily.) We will also be adopting a “Lie” perspective of interpreting groups as behaving like perturbations of vector spaces, in particular by trying to draw all edges of the same colour as being approximately (though not perfectly) parallel to each other (and with approximately the same length). which is the fully noncommutative version of the more well-known Jacobi identity for Lie algebras. This should be thought of as the “back” of the truncated parallelopiped needed to establish the Hall-Witt identity. This is the second component, and is the “front” of the truncated praallelopiped, minus the portions exposed by the truncation. Erasing everything except this triangle gives the Hall-Witt identity. 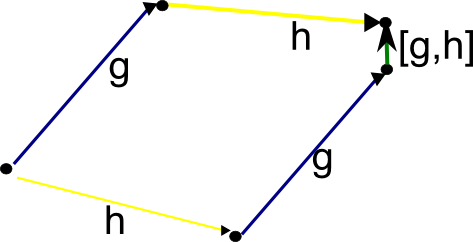 Alternatively, one can glue together Figures 18, 21, and 24 to obtain a truncated parallelopiped which one can view as a geometric representation of the proof of the Hall-Witt identity. Among other things, I found these diagrams to be useful to visualise group cohomology; I give a simple example of this below, developing an analogue of the Hall-Witt identity for -cocycles. Problem 1 (Erdős distance problem) Let be a large natural number. What is the least number of distances that are determined by points in the plane? Erdős called this least number . For instance, one can check that and , although the precise computation of rapidly becomes more difficult after this. By considering points in arithmetic progression, we see that . By considering the slightly more sophisticated example of a lattice grid (assuming that is a square number for simplicity), and using some analytic number theory, one can obtain the slightly better asymptotic bound . Theorem 2 One has . The proof neatly combines together several powerful and modern tools in a new way: a recent geometric reformulation of the problem due to Elekes and Sharir; the polynomial method as used recently by Dvir, Guth, and Guth-Katz on related incidence geometry problems (and discussed previously on this blog); and the somewhat older method of cell decomposition (also discussed on this blog). A key new insight is that the polynomial method (and more specifically, the polynomial Ham Sandwich theorem, also discussed previously on this blog) can be used to efficiently create cells. In this post, I thought I would sketch some of the key ideas used in the proof, though I will not give the full argument here (the paper itself is largely self-contained, well motivated, and of only moderate length). In particular I will not go through all the various cases of configuration types that one has to deal with in the full argument, but only some illustrative special cases. To simplify the exposition, I will repeatedly rely on “pigeonholing cheats”. A typical such cheat: if I have objects (e.g. points or lines), each of which could be of one of two types, I will assume that either all of the objects are of the first type, or all of the objects are of the second type. (In truth, I can only assume that at least of the objects are of the first type, or at least of the objects are of the second type; but in practice, having instead of only ends up costing an unimportant multiplicative constant in the type of estimates used here.) A related such cheat: if one has objects (again, think of points or circles), and to each object one can associate some natural number (e.g. some sort of “multiplicity” for ) that is of “polynomial size” (of size ), then I will assume in fact that all the are in a fixed dyadic range for some . (In practice, the dyadic pigeonhole principle can only achieve this after throwing away all but about of the original objects; it is this type of logarithmic loss that eventually leads to the logarithmic factor in the main theorem.) Using the notation to denote the assertion that for an absolute constant , we thus have for all , thus is morally constant. I will also use asymptotic notation rather loosely, to avoid cluttering the exposition with a certain amount of routine but tedious bookkeeping of constants. In particular, I will use the informal notation or to denote the statement that is “much less than” or is “much larger than” , by some large constant factor. See also Janos Pach’s recent reaction to the Guth-Katz paper on Kalai’s blog. Let be a natural number. A basic operation in the topology of oriented, connected, compact, -dimensional manifolds (hereby referred to simply as manifolds for short) is that of connected sum: given two manifolds , the connected sum is formed by removing a small ball from each manifold and then gluing the boundary together (in the orientation-preserving manner). This gives another oriented, connected, compact manifold, and the exact nature of the balls removed and their gluing is not relevant for topological purposes (any two such procedures give homeomorphic manifolds). It is easy to see that this operation is associative and commutative up to homeomorphism, thus and , where we use to denote the assertion that is homeomorphic to . Theorem 1 (Irreducibility of the sphere) If , then . 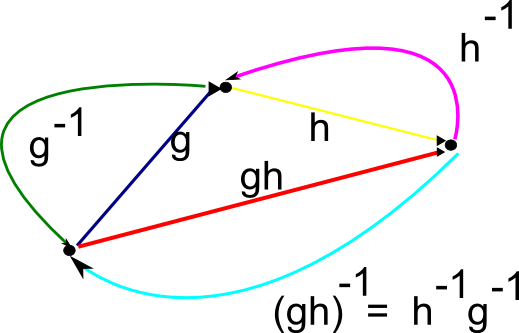 For (curves), this theorem is trivial because the only connected -manifolds are homeomorphic to circles. For (surfaces), the theorem is also easy by considering the genus of . For the result follows from the prime decomposition. But for higher , these ad hoc methods no longer work. Nevertheless, there is an elegant proof of Theorem 1, due to Mazur, and known as Mazur’s swindle. The reason for this name should become clear when one sees the proof, which I reproduce below. which is the connected sum of with an infinite sequence of spheres, or equivalently with a small ball removed. Contracting the small balls to a point, we conclude that , and a similar argument gives . One can ask whether there is a way to prove Theorem 1 for general without recourse to the infinite sum swindle. I do not know the complete answer to this, but some evidence against this hope can be seen by noting that if one works in the smooth category instead of the topological category (i.e. working with smooth manifolds, and only equating manifolds that are diffeomorphic, and not merely homeomorphic), then the exotic spheres in five and higher dimensions provide a counterexample to the smooth version of Theorem 1: it is possible to find two exotic spheres whose connected sum is diffeomorphic to the standard sphere. (Indeed, in five and higher dimensions, the exotic sphere structures on form a finite abelian group under connect sum, with the standard sphere being the identity element. The situation in four dimensions is much less well understood.) The problem with the swindle here is that the homeomorphism generated by the infinite number of applications of the associativity law is not smooth when one identifies the boundary with a point. The basic idea of the swindle – grouping an alternating infinite sum in two different ways – also appears in a few other contexts. Most classically, it is used to show that the sum does not converge in any sense which is consistent with the infinite associative law, since this would then imply that ; indeed, one can view the swindle as a dichotomy between the infinite associative law and the presence of non-trivial cancellation. (In the topological manifold category, one has the former but not the latter, whereas in the case of , one has the latter but not the former.) The alternating series test can also be viewed as a variant of the swindle. for some additional set . Using the identification then yields an explicit bijection between and . This week I was in my home town of Adelaide, Australia, for the 2009 annual meeting of the Australian Mathematical Society. This was a fairly large meeting (almost 500 participants). One of the highlights of such a large meeting is the ability to listen to plenary lectures in fields adjacent to one’s own, in which speakers can give high-level overviews of a subject without getting too bogged down in the technical details. From the talks here I learned a number of basic things which were well known to experts in that field, but which I had not fully appreciated, and so I wanted to share them here. This theme was reinforced by another plenary lecture by Ezra Getzler entitled “ -groups”, in which he showed how sequences of groups (such as the first homotopy groups ) can be enhanced into a more powerful structure known as an -group, which is more complicated to define, requiring the machinery of simplicial complexes, sheaves, and nerves. Nevertheless, this gives a very topological and geometric interpretation of the concept of a group and its generalisations, which are of use in topological quantum field theory, among other things. where ranges over all -groups; I do not know how to prove this identity other than via the above probability computation, the proof of which I give below the fold. The former claim is conjectural, whereas the latter claim follows from (for instance) Siegel’s theorem on the size of the class group, as discussed in this previous post. Ellenberg, Venkatesh, and Westerland have recently established some partial results towards the function field analogues of these heuristics. A special type of cocycle is a coboundary; this is a cocycle that takes the form for some function . (Note that the cocycle equation (1) is automaticaly satisfied if is of this form.) An extension of a dynamical system by a coboundary can be conjugated to the trivial extension by the change of variables . 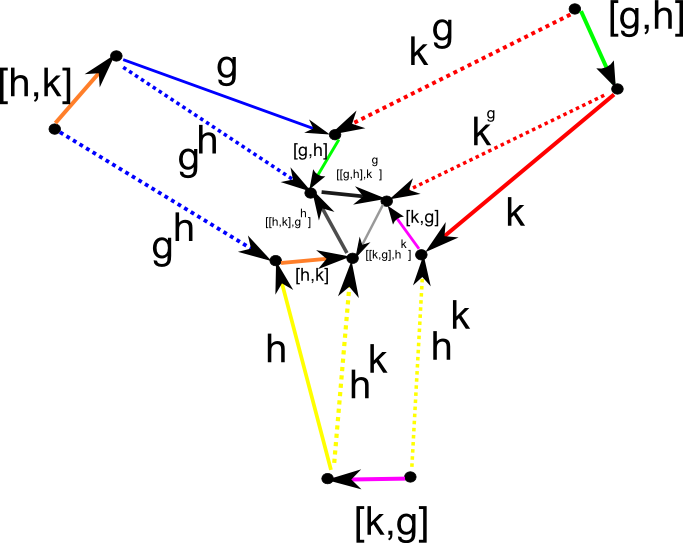 While every coboundary is a cocycle, the converse is not always true. (For instance, if X is a point, the only coboundary is the zero function, whereas a cocycle is essentially the same thing as a homomorphism from G to U, so in many cases there will be more cocycles than coboundaries. For a contrasting example, if X and G are finite (for simplicity) and G acts freely on X, it is not difficult to see that every cocycle is a coboundary.) One can measure the extent to which this converse fails by introducing the first cohomology group , where is the space of cocycles and is the space of coboundaries (note that both spaces are abelian groups). In my forthcoming paper with Vitaly Bergelson and Tamar Ziegler on the ergodic inverse Gowers conjecture (which should be available shortly), we make substantial use of some basic facts about this cohomology group (in the category of measure-preserving systems) that were established in a paper of Host and Kra. The above terminology of cocycles, coboundaries, and cohomology groups of course comes from the theory of cohomology in algebraic topology. 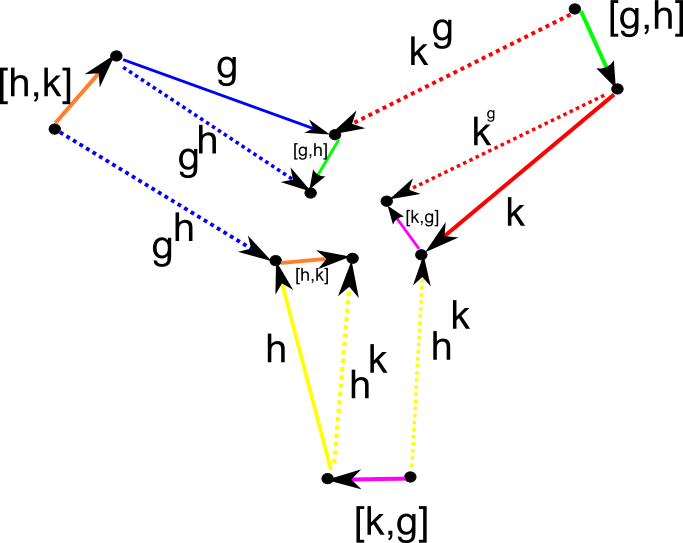 Comparing the formal definitions of cohomology groups in that theory with the ones given above, there is certainly quite a bit of similarity, but in the dynamical systems literature the precise connection does not seem to be heavily emphasised. The purpose of this post is to record the precise fashion in which dynamical systems cohomology is a special case of cochain complex cohomology from algebraic topology, and more specifically is analogous to singular cohomology (and can also be viewed as the group cohomology of the space of scalar-valued functions on X, when viewed as a G-module); this is not particularly difficult, but I found it an instructive exercise (especially given that my algebraic topology is extremely rusty), though perhaps this post is more for my own benefit that for anyone else.